The CoBrA art group gets its name from the cities of Copenhagen, Brussels and Amsterdam (where the artists lived) and Cobra has been called the last great avant-garde art movement of the century. 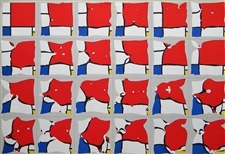 AffordableArt101 offers original prints by Pierre Alechinsky, Asger Jorn, Karel Appel, Reinhoud d'Haese, and Pol Bury. 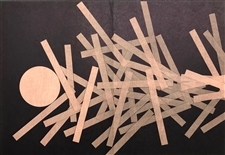 Belgian printmaker Raoul Ubac was sometimes associated with the CoBrA group. Medium: original lithograph (in two sections). Published in 1964 by Eberhard Kornfeld for 1 Cent Life, from the unsigned edition of 2000. Sheet size 16 1/4 x 22 3/4 inches. There is poetry text (composed by Walasse Ting) on verso, as issued. Please note: this work was printed on two separate sheets which the collector will join together before framing. The inside edges have been trimmed slightly by necessity (in order to separate an adjoining unrelated litho)-- that is the nature of this format. Not signed. Medium: original lithograph. Executed in 1982 for what was planned to have been the very last issue of Derriere le Miroir (issue No. 250), and published in Paris by the Maeght atelier. Many of the artists who had been regular contributors to DLM throughout its more than thirty years of publication, contributed original prints for this project. Sheet size: 15 x 22 inches (380 x 558mm); there is a center fold with text on verso, as published. Not signed. Condition: there are stitch holes along the center crease from the binding. Medium: original woodcut. This original Raoul Ubac woodcut was issued in 1958 for the hard-to-find XXe Siecle (No. 10), published in Paris by San Lazzaro. Sheet size 12 3/8 x 9 1/2 inches (313 x 243 mm). Not signed. Condition: minor bumps to two corners of the sheet. Medium: original lithograph. Printed in Paris in 1967 by Clot, Bramsen et Georges and issued in an edition of 2500 for "Les Temps Situationistes" (The Situationist Times -- a radical journal with anarchist tendencies); this print is now scarce. Sheet size: 10 3/4 x 8 1/2 inches (275 x 215 mm). The artist's name appears in text beneath the image. Not hand-signed. Medium: original lithograph. Executed by Pol Bury for Derriere le Miroir in 1978 (issue number 228) and published in Paris by Maeght. Sheet size: 15 x 22 inches; with a center fold and text on verso, as issued. Not signed. Medium: original lithograph. Executed by Pol Bury for Derriere le Miroir in 1969, and published in Paris by Maeght. Sheet size: 15 x 22 inches; with a center fold and text on verso, as issued. Not signed. Medium: lithograph (after the gouache). Executed for Derriere le Miroir (No. 148) in 1964, and published in Paris by Maeght. This lithograph was published on the occasion of the inauguration of the Fondation Marguerite et Aime Maeght. Sheet size: 15 x 21 1/4 inches (377 x 535 mm); with a center fold, as issued. Not signed. Medium: original lithograph. Executed for XXe Siecle (No. 14) in 1960 and published in Paris by San Lazzaro. Sheet size 12 1/4 x 9 1/4 inches (310 x 233mm). Not signed. Condition: there is a bump to one corner. XXe Siecle (Chroniques du Jour) was a deluxe art revue that was the source of many outstanding prints. It was published by Gualtieri di San Lazzaro from 1938-1939, and again from 1951 until 1978 (known as the Nouvelle Serie). Many important artists contributed original prints, including Miro, Picasso, Chagall, Braque, Villon, Matta, Indiana, Rosenquist, Lam, Dali, Zao Wou-ki, Matisse, Delaunay, Ernst, Poliakoff, Alechinsky, Soulages, Leger, Moore, Kandinsky, Agam, Arp, Calder, Magnelli, Baj, Marini and Vasarely. 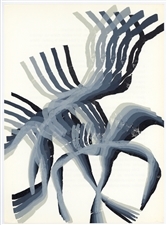 Raoul Ubac original lithograph "Torse"
Medium: original lithograph. This print was pulled in Paris in 1966 by the legendary atelier of Fernand Mourlot. Published in a limited edition of 1500 impressions on Chiffon de Mandeure wove paper. The total sheet measures 10 x 7 1/2 inches (255 x 187 mm); there is printed text on the back (as issued). Not signed. This original Ubac print is from the very scarce and lavishly produced limited edition catalogue, published by Maeght and London's Redfern Gallery on the occasion of a major 1966 exposition at the Redfern. The lithograph was executed by the artist as an original contribution expressly for this catalogue. Medium: original lithograph. Executed by Pol Bury for Derriere le Miroir in 1969, and published in Paris by Maeght. Sheet size: 15 x 11 inches; with text on verso, as issued. Not signed. Medium: original lithograph. Executed for XXe Siecle for the special Christmas issue in 1961, published in Paris by San Lazzaro. Sheet size: 12 1/4 x 9 5/8 inches (313 x 244 mm). Not signed. Medium: original lithograph. Published in 1964 by Eberhard Kornfeld for 1 Cent Life, from the unsigned edition of 2000. Size: 16 1/4 x 11 1/2 inches (sheet). There is poetry text (composed by Walasse Ting) on the back, as issued. Signed in the plate (not by hand). Medium: original lithograph. Published in 1964 by Eberhard Kornfeld for 1 Cent Life, from the unsigned edition of 2000. Size: 16 1/4 x 11 1/2 inches (sheet). There is poetry text (composed by Walasse Ting) on verso, as issued. Signed in the plate (not by hand). Medium: original lithograph. Published in 1964 by Eberhard Kornfeld for 1 Cent Life, from the unsigned edition of 2000. Size: 16 1/4 x 11 1/2 inches (sheet). There is another composition printed on the back side, as issued. Not signed. Medium: lithograph (after the original). Issued in 1968 in an edition of 420 for "Correspondances", published by Editions des Nouvelles Images a Lombreuil, Loiret. This impression on BFK Rives wove paper was printed in Paris by l'Imprimerie du Lion. The sheet measures 12 3/4 x 9 3/4 inches (325 x 250 mm). Not signed. Rare. Medium: lithograph (after the gouache). Executed for Derriere le Miroir (No. 148) in 1964, and published in Paris by Maeght. This lithograph was published on the occasion of the inauguration of the Fondation Marguerite et Aime Maeght. Sheet size: 15 x 20 3/4 inches (377 x 525 mm); with a center fold, as issued. Not signed. Condition: the right side has been trimmed slightly. Medium: original lithograph. Executed for the front cover of "Poetes, Peintres, Sculpteurs" issue of Derriere le Miroir (No. 119) in 1960. Total sheet size: 14 7/8 x 10 7/8 inches (375 x 275 mm). Not signed. Condition: this was the actual cover and the edges of the sheet have been trimmed. There is wear and discoloration to the margins. There is printed text both above and beneath the lithograph, as shown in the second photo. 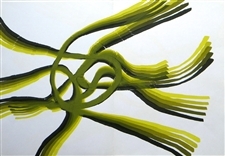 Raoul Ubac original lithograph "Limites"
Medium: original lithograph. Executed for Derriere le Miroir in 1965 (no. 155), and published in Paris by Maeght. Sheet size: 15 x 11 inches (378 x 277 mm). There is printed text on the back side, as issued. Signed by Ubac in the stone (not by hand). Condition: there is minor creasing and soiling. Medium: original lithograph. Executed in 1982 for what was planned to have been the very last issue of Derrière le Miroir (issue No. 250), and published in Paris by the Maeght atelier. Many of the artists who had been regular contributors to DLM throughout its more than thirty years of publication, contributed original prints for this project. Among these were Chagall, Miro, Kelly, Chillida, Palazuelo, Garache, Adami, Fiedler, Ubac, Pol Bury, Alechinsky, Tal-Coat, Riopelle, Tapies, Bram van Velde and several others. Sheet size: 15 x 11 inches (380 x 277mm); there is text on verso, as published. Not signed. Medium: original lithograph. Executed for Derriere le Miroir (issue no. 142) in 1964, and published in Paris by Maeght. Sheet size: 15 x 11 inches (380 x 275 mm); with text on verso, as published. Not signed. Medium: original lithograph. Executed for the "Poetes, Peintres, Sculpteurs" issue of Derriere le Miroir (No. 119) in 1960. Sheet size: 15 x 11 inches (380 x 277 mm). There is printed text on the back side, as issued. Not signed. There is a stain at the top left corner.